While our "Top cat" was attending his class reunion, the mice (Trish and I) took advantage of the opportunity to scamper around the Virgil Hickox home to play! It would be our chance for a unique girl's night-out...perhaps more like a girl's night-in event! Upon entering through the front door, I noticed how eerily quiet it seemed to be that night. It was after all only about 10pm on a Saturday night and with the bar below I expected to hear a bit more noise. 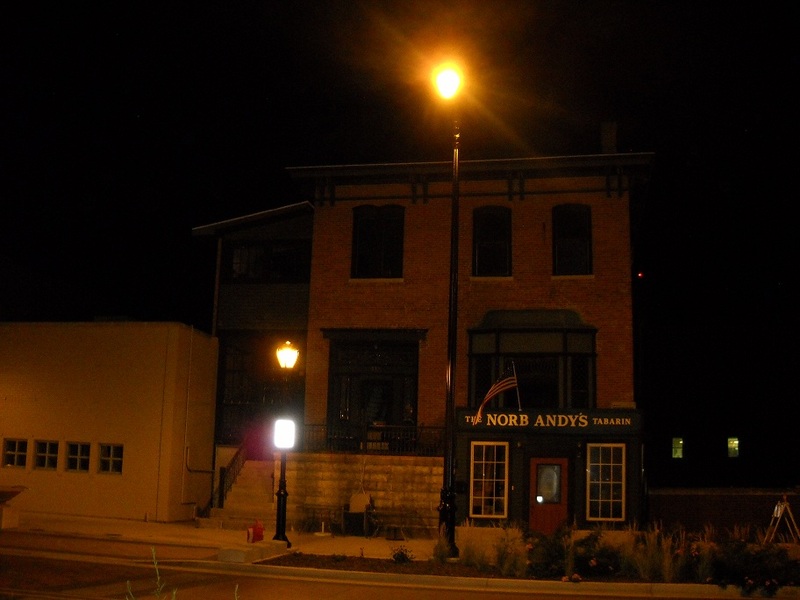 After we dropped off our equipment and before we shifted into investigation mode, we decided to start our evening downstairs at Norb Andy's, investigating the potent spirits they served. Just as we were preparing to exit out the front door, we heard loud music coming from the adjacent room. When we entered that room we found the stereo blaring. This was the same stereo Dave found turned on during one of his previous visits. It was strange because I know we didn't hear anything when we had entered just 15 minutes earlier. I think this was a portent of things yet to come! Downstairs at Norb Andy's we had the opportunity to talk with the Manager Don while the attentive bartender kept us supplied with liquid courage. After an enjoyable interlude we headed back upstairs, prepared to continue our adventure. We were aware of the Alice stories, the spirit of a young girl claimed to occupy the home, and based on our previous visits, we decided to focus on communicating with her. Besides our cameras, recorders, and K2, Trish also brought along was a couple feathered boas. She told the spirits they could play with them, could even pull them off it they wanted. After a quick survey of the first floor we scaled the stairs and felt drawn to the second floor parlor. In this room the K2 activity increased and appeared to be responsive to Trish's questions. We also began hearing what I'll describe as a "Clicking" sound by the window, a noise we never did quite figure out. Because of what we were experiencing in that room, I decided to take some pictures. At one point I set the timer on my camera and invited whoever was there to join us in the picture. 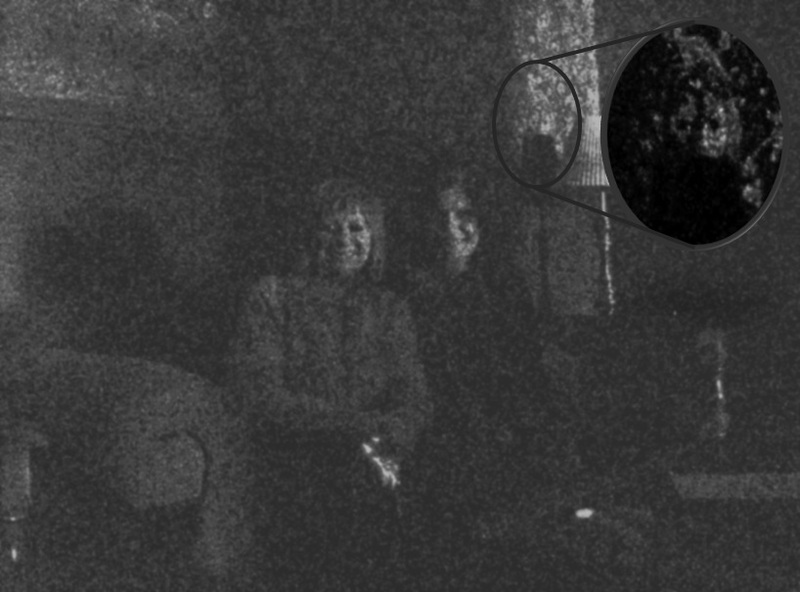 The results from that picture are shown below; I was intrigued at what I may have captured? After we left the parlor, we were standing at the top of the stairs; we began to feel cold chills passing between us. Trish also felt her hair getting tugged at this point and not too long after, my boa fell off and dropped to the floor, the first of several incidences with our boas. We then went downstairs to explore the library area. While we were standing on opposite sides of the room the door to the hallway suddenly slammed shut and vibrated for several seconds afterwards. 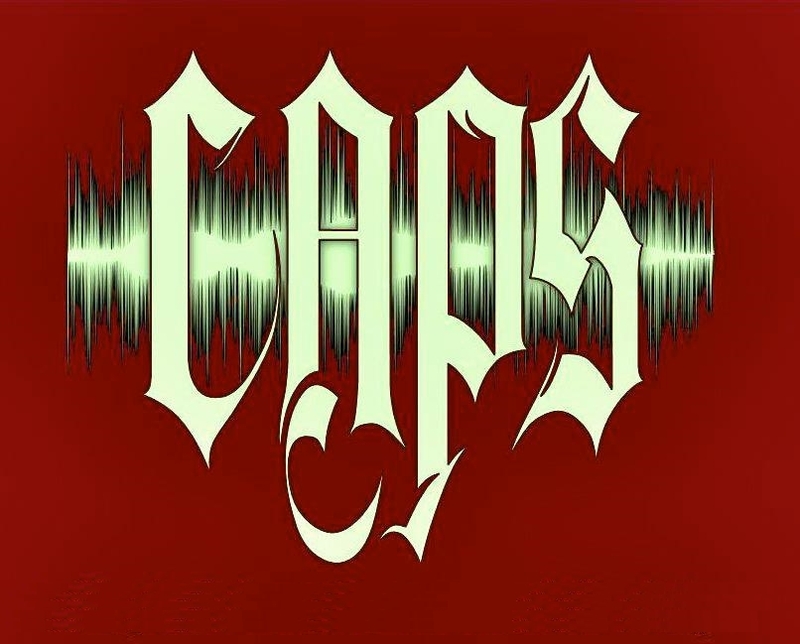 Upon reviewing our recordings, I realized that just prior to this event Trish and I were bragging to each other about how brave we had been, then we captured an EVP that sounds like a child's voice to me saying, "Let's scare them...Want too?" Throughout the remainder of the night, Trish and I repeatedly experienced waves of cold chills; almost as though something was following us from room to room. We thought we heard disembodied voices a few times and perhaps also saw some moving shadows. On more than one occasion, we also heard the sound of footsteps on the hardwood floor, the most profound we captured on our recorder seemed to be following us down the stairs. As experienced during previous investigation, we also had issues with some of our equipment. It seemed that whenever we left one of our recorders by itself in a room, it was off when we returned. As for me, it was perhaps one of the best girl's night-out. Seems to me, that perhaps we weren't the only "mice" that appreciated the absence of the "Top Cat". Male voice captured on Second floor... Vicki? While Trish is talking dowstairs, listen for female voice...Something about "Norma"
"Let's Scare them...Want too?" This was captured before the door slammed. You'll need headphones for this EVP!